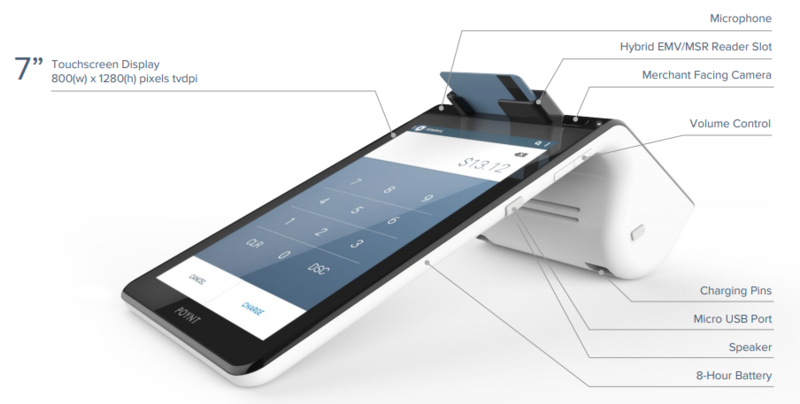 Poynt can be used wherever payments are happening. It has two screens – the bigger one should face in toward the merchant, and the smaller is directed at customers. Make sure it’s in a place with strong, private WiFi, or hook up the docking station to an Ethernet cable. At Poynt we have made it easy to access sophisticated technology, without compromising security or user experience. For more information and step by step instructions click on PDF download. Every smart terminal comes with a power dock,to keep it fully charged. Simply plug in, then set your device on top. You can secure it to the counter by peeling off the plastic film from the bottom and placing it down carefully. But first make sure it’s faced the correct way. To power-on, just press and hold the power button for about three seconds. Don’t forget to fully charge your smart terminal to maximize its battery life. Each terminal comes with three rolls of thermal printer paper. To load the roll, make sure to insert it with the paper hanging down, as shown in the product sheet. Download the product sheet above for full details. The Poynt device needs the Internet to make its magic, and is designed to work with both old and new connection types. Ethernet There’s an Ethernet port on the back of the power dock. To use it, the Poynt device must remain in its dock.